The planer is no doubt an indispensable tool for shaping and smoothing wood surfaces. The uses for which this carpentry tool is implemented includes reclaiming old wood, cleaning up inexpensive rough cut boards, creating custom thickness to leveling surfaces to a particular thickness. In time past, wood planing was done by the use of a crude hand plane. Today, technology has evolved into electric plane machines which permit the woodworker to plane with greater efficiency and speed. 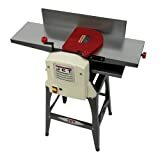 Mastery of the wood planer is a very crucial skill essential for many woodworking tasks and your woodshop could never be complete without the addition of the planer to your set of woodworking tools. Here we will show you how to use a wood planer and cover some of the basic steps required for the successful use of this essential tool. The first step towards the mastery of the wood planer is selection of the appropriate tool; either a power planer or a hand plane. Let me start by clarifying something that I didn’t know for years as a carpenter: The power version is referred to as a planer while the hand held tool is actually just called a plane or hand plane. Hand planes exist in varying forms. The distinct feature of varying kinds is size. The longer the body of the plane, the more the observed accuracy, though short planes are very easy to control for specific woodcraft projects. This is basically true since the length of the planer enhances the planer’s ability to evenly bridge troughs and peaks in wood surfaces. Joint planer, or jointer – a long hand plane suited for trimming and straightening long surfaces. 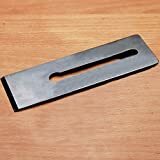 It’s about 22 inches in length and is generally used to smooth the side of the board for joining it with other boards to make things like table tops. Block plane – the shortest in length, is very useful for shaving thin pieces as well as being very suitable for planing the end grain on the corners of a miter. 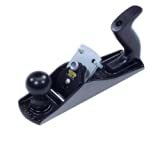 Jack plane – ranges from 12 to 17 inches. It used for general purpose smoothing and re-sizing of boards. Some have also used it for texturing boards and other techniques to give their work more character. 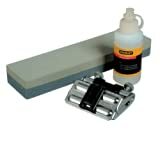 Smoothing plane – is about 10 inches long; it is used to smooth the surface of your projects to prepare them for finish. It is not as widely used today with the introduction of sandpaper as sandpaper can do a similar job in far less time. Razor-sharp planer blades plus a mastery of planing angle are keys to wood planing efficiency. The blade of every planer needs to be kept razor-sharp. There are many techniques employed by different woodworkers regarding methods of sharpening the planer blade, however, one simple method is to situate 220-grit wet/dry sandpaper on a flat surface, then hold the blade at 30 degrees max in such a way that the bevel is flat against the sandpaper. To sharpen, rub the blade around the sandpaper at this angle in a circle while applying a downward pressure. Watch out for accumulation of metal shavings along the back. This is indication of the blade’s readiness for use, though you must test sharpness. When you are sure your blade is sharp enough, wipe the flat blade across the sandpaper to remove the burs from the back of the blade. A comprehensive tutorial on sharpening and other care of your plane can be found in this video below. Aside from the sharpness of the planer blade, the angle of the blade is another important factor to consider in enhancing mastery and efficiency of wood planning. The angle of the blade marks the thickness of the shavings the planer will take from the surface of the wood. To avoid tearing the wood or even jamming the planer, you must ensure that the blade is not too deep. You can attune the blade angle by turning the deep adjustment wheel situated at the blade assembly. Continue attuning the blade angle until its protrusion is only underneath the sole of the planer. The best way to handle this is to use shallow angle and then gradually increase the cut. In using the Wood Planer to smooth rough surfaces, techniques for aligning the wood plane revolves around securing the planer, lowering the cutting head to make contact with the wood and running the planer one pass at a time. It’s important to ensure removal of any nails or staples before running the planer in the direction of the grain. The number of passes differs when using hand tools—handheld planers, either manual planers or power planers. There are more passes when using the power hand planer compared to the manual hand planer. One of the greatest challenges in woodworking is the mastery of hand planes. This is especially true since using these hand tools especially for a novice woodworker requires hard work when you have not developed good technique. The difficulty in mastering power planes, which is perfect for trimming doors and planing rough board, is evident in snipe and unsteady cuts. Woodworkers must avoid plane jarring and breaking up of shavings by ensuring that they plane in the direction of the grain whenever possible. To make the job easier, moderate adjustment of the screws’ width underneath the blade, and reduction of the width of the opening will help reduce the cut. You can equally adjust the depth of cutting by adjusting the brass knob behind the blade on your hand plane. For perfect and fine grooves, the woodworker needs to round the sharp edges of the blade by applying more pressure on the sides while honing the blade. To plane any wood surface with either the hand plane, you need to grasp the handle and lower the cutting edge until it makes contact with the wood surface. Then, run the tool over the wood in the direction of the grain, (unless planing end grain for joints, etc), and make one pass at a time, at the edge of the surface. You must ensure that you get rid of things like staples and nails from the wood. Once the planer’s blade makes contact with the wood surface, lower the head for the first cut. Apply a downward pressure on the front knob and press forward with the back handle, push the plane across the surface following unceasing smooth motion. While planing across the surface along the grain, watch out for uneven spots on the wood surface. When using a power planer be sure to test the depth of the cut on a scrap piece before committing to a depth. You can always make another pass but you can’t put the wood back on. Planing end grain is quite difficult since the fibers are generally 45 to 90 degrees to the surface and can easily be torn. Planing should be concentrated at the center of the board. You can support the rear edges with a scrap piece of wood at the back of the work. Adam Cherubini, a long-time woodworker and contributor to Popular Woodworking Magazine gives his insight regarding planing end grain in an excerpt from popularwoodworking.com. Is there a secret to planing end grain? 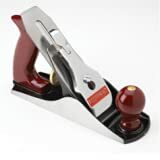 Is a low-angle block plane required? I don’t think so. My trusty wooden smoother does a good enough job for me. What you need to plane end grain is a SHARP plane. If that’s your block plane, use that. If I had to come up with a secret I’d say I prefer to plane end grain with a plane that has a cambered iron. That way I can square up a hand-sawn end the same way you square an edge with a try plane. The expected result of wood planing is a complete smooth and flat surface. To confirm the accuracy of your planing efficiency, simply place a straight edge along the surface which should flush with the edge in spite of the position. If in any case there is observed undulation, repeat the process until you have the desired surface.